This article is about the BattleMech. For the Clan faction, see Crusader Clans. The Crusader was initially designed as a close combat BattleMech for the Star League Defense Force, but soon proved itself to be a very adaptable, multi-role design. This reliable workhorse of the SLDF, while not excelling in any one job, was capable of accomplishing just about any mission, whether it be close assault, anti-aircraft, counter-insurgency, or even reconnaissance. Its versatility and large number of manufactures ensured the Crusader its place as one of the most common heavy 'Mechs in the Inner Sphere. The Crusader received its baptism of fire during the Reunification War and remained a common fixture in the regiments of the SLDF for many centuries. Even after the fall of the Star League, the various Successor States continued to field large numbers of Crusaders in their armies, thanks to factories located on Tharkad, Oliver, Asuncion and Bernardo. 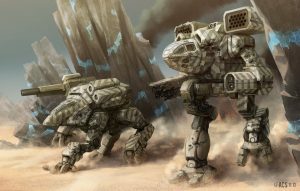 House Steiner in particular was a notable Crusader use, thanks in part to their well-trained technicians who could have damaged units turned around and ready to fight in a single day. A variety of new production variants and field modification kits were turned out for the Crusader after the recovery of the Helm Memory Core, just in time for the Clan Invasion. In the wake of the Clan Invasion, one of the first new Crusader variants was built by the Cosby BattleMech Research Firm, the (in)famous producer of the No-Dachi 'Mech. Hoping to overcome the lack of prestige of their previous design and win the favor of the Coordinator, the company acquired manufacturing rights to the Crusader through the hostile takeover of another company and unveiled an updated variant of the 'Mech around the start of the FedCom Civil War. Additional variants would continue to be produced in the years since, including models utilized by the Word of Blake during the Jihad. The primary long-range weapons on the Crusader were two Magna Longbow-15 LRM-15 launchers, providing the Crusader with long-range fire support capabilities that can compete with the Archer and Catapult. These were supplied by two tons of reloads split between the side torsos. For short range combat, the 'Mech carried two Harpoon SRM-6 launchers and two Intek Medium Lasers. Finally, to deter infantry attacks against the Crusader, two M100 Heavy Machine Guns were mounted on the 'Mech. One ton each of SRM and machine gun ammunition was carried in the center torso. Each arm was equipped with an LRM launcher, laser and machine gun, while the SRM launchers were built into the legs and mounted at hip height to provide a stable firing location and avoid interference with the LRMs' flight path. Early Crusader models had issues with the arm-mounted launchers and lasers overheating and causing stress to the actuators and internal structure, but this was rectified with the additions of the now-distinctive collars which deflect hot gasses away. The Crusader was well-protected with twelve tons of armor, particularly around the legs. This not only made it a good hand-to-hand combatant but, for those so equipped, made it well-suited for performing Death from Above attacks. A thirteen and a half ton fusion engine allowed the Crusader to achieve a decent cruising speed of 43.2 km/h. One disadvantage to the Crusader was its inadequate heat management system, carrying just ten standard heat sinks to handle all the waste heat produced by its weapons and equipment. ↑ 1.0 1.1 1.2 1.3 1.4 1.5 1.6 1.7 1.8 Technical Readout: 3039, p. 294, "CRD-3R Crusader"
↑ MUL Profile for CRD-1R includes BV2. ↑ MUL Profile for CRD-2R includes BV2. This page was last edited on 7 April 2019, at 14:56.